Philip Hepworth - Tibshelf and Newton mining questions - 1934, My Grandfather Harry Smith, 59, was killed in a clay pit by a collapse of clay probably triggered by an explosive left accidentally in the clay. Tibshelf and Newton mining questions - 1934, My Grandfather Harry Smith, 59, was killed in a clay pit by a collapse of clay probably triggered by an explosive left accidentally in the clay. Marg of Sutton-in-Ashfield Library has given me your address. I had several questions for her relating to the location and dates for the pits in the small valley going eastwards from Dimmingsdale (spelling?) to Deadwater (on the land belonging to Red Barn Farm, Newton, and the area at the Notts/Derby border at the bottom of Huthwaite Hill, and Revill's Hill (alternate names Blackwell Lane or Wragg's Lane). My next questions relate to the Tibshelf Collieries Nos.1, 2, 3, and 4. Prior to reading your material I only knew of them as Top Pit and Bottom Pit. My Grandfather Harry Smith worked at the Bottom Pit until about 1932, when he was transferred to surface work at the Top Pit. He was killed in a clay pit by a collapse of clay probably triggered by an explosive left accidentally in the clay. It occurred on October 31, 1934, and there was an inquest reported in a local paper. He was aged 59. As far as I know he was a miner all his working life, and for a period was a butty. He lost an eye at some point in his mining career. My paternal grandfather was John William Hepworth, who worked as a bricklayer in the local coal mines, probably mostly Brierley Colliery (Stanton Hill/Sutton), and again all his working life. He died in 1960 at age 85. He too lost an eye in what is likely to have been a mining accident. I would like to know a little more about Brierley, and when it opened and closed. I am finding your mining collection fascinating. I now live in Canada, after being brought up in Sutton. Greengate pit, Gothard’s to the south side of Boultsby Lane from Newton. three shafts a Eight Acres and Cupola (or Capela) off Boultsby Lane (….?). To the south lay 3 shafts at Saxton’s pits or Pitfield Lane, and Adit level. New Lane pit on junction of New Lane and Wragg Lane between Huthwaite and Blackwell. To the north lay Dosay Lane pit (or Dosaylaneld or Dosaylands). Five Acre pits (William Downing). Ransom (Ramson?) Barn pit near Red Barn, Dunsil coal (John Chambers) 1852? Red Barn, Pingle pit (Hannah Sampson). Stone pit, Diminsdale pit (worked by Bodon and Mellers), 62 yards (57m) deep to Dunsil. To the east lay Sharp’s Shop pit 30 yards (27.5m) to Top Hard. Woodwell (or Woodrull pits) purchased by E Barrett in 1854. At Scoftyard Lane leading from Newton Green to Tibshelf the seam lay at 20 yards (18m) deep. It is assumed as previously stated that all were closed at this date, as they are not mentioned in either of the following lists. 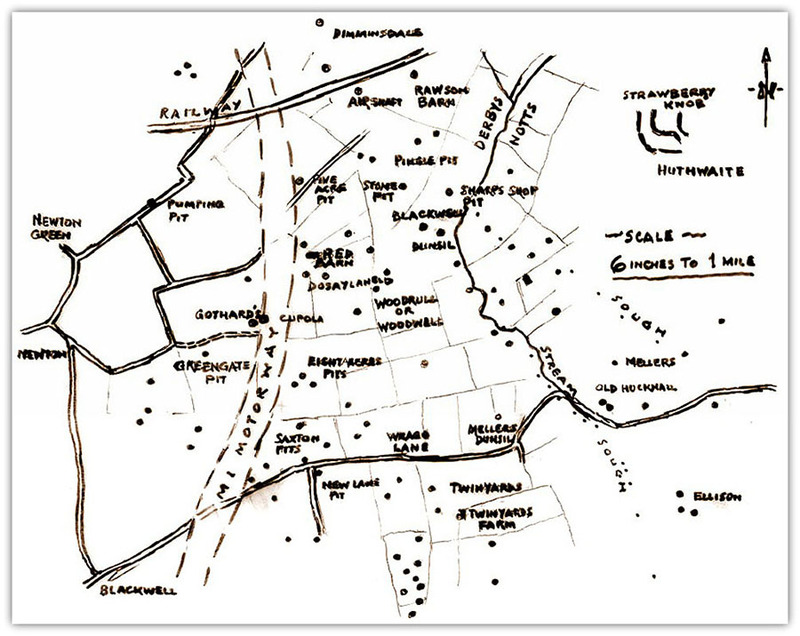 Philip, the above plan shows the numerous pits around Blackwell, Newton, Huthwaite area. There are more surrounding that portion. The small dots are air shafts on the line of 2 water soughs. The pits you are interested in are shown. Any relation to Nancy Hepworth of Sutton? She had a brother, he would be about 78 now. Their father was the Librarian at Sutton when the Library was on Oates's Hill. 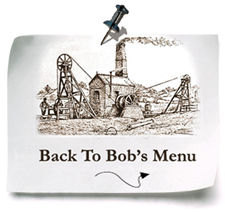 This week’s downfall of snow and rain is believed to have been the cause of a fatality on Wednesday (October 31, 1934) in the clay pit connected with Tibshelf Nos.3 and 4 Collieries, belonging to the Babbington Coal Company. The victim was Harry Smith (59), widower, 12, Littlemoor, Newton, who was found by another workman buried up to the waist in clay. The District Coroner (Dr. R.A. McCrea), who sat with a jury, of which Mr. T. H. Gray was the foreman, investigated the circumstances at Newton Church Hall yesterday (Thursday). Mr. J. Hall (Mines Inspector) was present, while the manager of the collieries (Mr. A. Riley) represented the owners, and Mr. F. Hayes, the Notts. And District Industrial Union. Miss Gladys Smith said her father was a quarry labourer. Some time ago he met with an accident, which involved the loss of an eye. Otherwise his faculties were good. Dr. N. F. Graham, Tibshelf, said the cause of death was shock, following severe injuries, including a fracture of the right thigh. The loss of an eye did not interfere with Smith’s proper working in the clay pit. Arthur Riley, clay pit labourer, 57, Lincoln Street, Tibshelf, said he reached the brickyard about 1.55 p.m. on Wednesday for work, and found Smith BURIED UP TO HIS WAIST in clay. His head, chest and arms were free. The clay seemed to have fallen from the top of the face of the clay pit, but he could not exactly say where. Smith was unconscious and groaning, and witness could not get any answer to his question. He tried to extricate Smith, but could not do so owing to the weight of the clay, and he had to call for assistance. Nobody was working with the deceased. The Coroner: Do you often get falls like this? Witness: Sometimes when it has been raining. The snow and water soaks into the back of the “beaks”, and then the clay falls without warning. Thomas Millward, 5, Littlemoor, Newton, brickyard foreman said Smith was working alone at the time of the fall, about three yards from the face of the pit. Witness had previously examined the face, and there did not seem to be the possibility of a fall. He was called to the scene about 2 p.m. When they had extricated Smith, there was no sign of life. About HALF A TON OF CLAY had fallen upon him. Replying to the Mines Inspector, witness said they put shots into the bottom portion of the face, but the last one fired prior to the accident was the night before. The Mines Inspector: Near where this fall took place? Mr. A. Riley, on behalf of the owners and management, expressed regret at the fatality and sympathy with the bereaved family. The deceased was a good workman and had been employed by his firm for over 25 years. The foreman associated himself and the jury with those sympathetic sentiments. The jury decided to hand over their fees for the purchase of a wreath as their tribute to the deceased’s memory. The funeral took place on Saturday (November 3, 1934), at Blackwell Churchyard, of Mr. Harry Smith (59), widower, 12, Littlemoor, Newton, who, as reported last week, was fatally injured in the clay pit connected with Tibshelf Nos.3 and 4 Collieries. The hymn “Jesu, Lover of My Soul” was sung in church. Mr. S. Ordish being organist. The Rev. T.S. Hudson officiated. The mourners were:- Mr. J. E. Smith, Miss G. Smith, Miss P. Smith, Mr. H. Smith, Mr. G. Smith, Miss R. Smith (sons and daughters); Mr. And Mrs Hepworth (son-in-law and daughter); Mr. And Mrs. A. Smith, Mrs. T. Smith, Mrs. E. England (brother and sisters in law); Mrs. Bell, Mr. And Mrs. Sturgess (brother-in-law and sisters); Miss B. Harby, Mr. W. Smith and Mr. B. Smith., Mr. T. Millward and Mr. H. Watkinson senr. Represented the Babbington Coal Co. The bearers were Messrs. H. Harby (nephew), Leeson, Holden and G. Clarke. Flowers were sent by: The Family; Doris, Harold and Nancy; Aged Mother, youngest Brother and Sister; Tom and family; Alf and family; Ada, Alice and Mansell; Louisa and family; Sally, Arthur and Joan (Cowes); Joe and family; Aunt Lizzie; Reuben and Agnes; Mary and Arthur; Bernard; Lizzie and Jack; Mrs Leusley; Wilf and May; Joe Smith and family; Nephews and Nieces at Sheffield; Members of the Jury who presided at the inquest; Mr. and Mrs. Hepworth senr. ( Sutton-in-Ashfield); Mr. and Mrs. Cope and family; Mres Dickens and Frank; Mr. and Mrs. Wildgoose and Frances and Fred; Mr. R. Norton, senr. Mr, and Mrs. S. K. Spencer; Fellow Workmen. Hello Fionn, I have just been perusing your site, specifically looking for the following death. “On September 21st 1918, at 6, Cross Gates Incline, Pilsley Colliery. David Jones, age 33yrs. of 69, Queen Street Pilsley. Coal Miner, was partially buried by accidental fall of roof (bind). Certificate received from Albert Green, Coroner. Inquest held Sept 23rd 1918. Hope this will be of some use to your website, and if an inquest report exists and you have access to it, then it would be very helpful to me in my family history research. I am interested in one of the images on your site, the picture of a miner bathing while his daughters study and wife darns nearby. Aside from your site, I've only been able to find a cropped version of this picture. Do you have a more complete one that you could send to me? 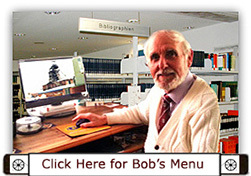 I've downloaded your montage, but I'd like to have the picture alone, if possible. Also, any information you could share about the origins or credit for the photo would also be much appreciated. The version I found was much inferior. 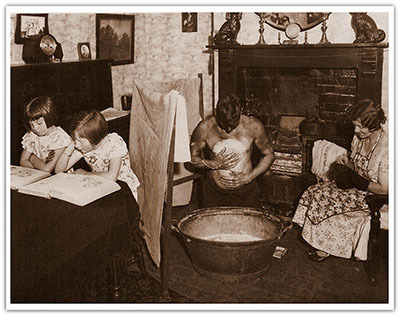 It was cropped and credited as "Mary Evans; Roger Worsley Archive - A South Wales miner washes at a tin bath in front of the fire, while his wife sits mending socks 1925" I was not able to establish if Mary Evans was the photographer or not; it seems likely that she was a social activist who used photography. I shall have to look further into her identity. Any details on your source would be much appreciated. I was able to locate another copy at http://www.theforgottenconscript.co.uk They were able to tell me that the image was likely salvaged when the National Coal Board was disbanded; apparently much or all of the NCB archive was destined for the rubbish tip until someone intervened. I'm not sure how much was saved. In any case, they don't know any more about the image either. Quite to my surprise, they thought I objected to the picture on some unstated grounds and voluntarily offered to remove it. I wondered if you could help please. I’m making a documentary for BBC East Midlands about 1966 and I’m trying to find photographs and film footage of three pits in the Ilkeston area that I understand closed that year - Cossall, Shipley, Shipley Again and Woodside. I’d be very grateful if you could steer me in the right direction. Jigjog Media for BBC East Midlands.